The outgoing Namibian President Hifikepunye Pohamba has won the world's most valuable individual award, the Mo Ibrahim prize for African leadership. The $5m (£3.2m) award is given each year to an elected leader who governed well, raised living standards and then left office. But the previous award was the fourth in five years to have gone unclaimed. 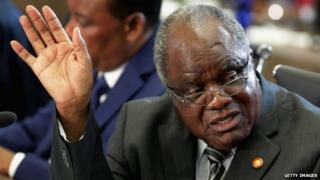 Mr Pohamba, a former rebel who fought for his country's independence, has served two terms as Namibian president. He was first elected in 2004, and again in 2009. He is due to be succeeded by President-elect, Hage Geingob. Salim Ahmed Salim, the chairman of the committee that awarded the prize, said that under Mr Pohamba, Namibia had cemented its reputation as "a well-governed, stable and inclusive democracy with strong media freedom and respect for human rights". A statement from the Namibian presidency said Mr Pohamba was "humbled by this gesture". According to the statement, the president hoped to use the prize to advance the objectives of the Hifikepunye Pohamba foundation, which helps students from disadvantaged backgrounds to pursue higher education. Mr Pohamba was a founding member of the South West Africa People's Organisation (Swapo), an armed movement that waged a decades-long campaign against South African rule. Since the country won independence in 1990, Swapo has dominated politics, usually winning huge majorities in elections. Before becoming president, Mr Pohamba served as a minister for land affairs. He oversaw a scheme under which some land that had been owned by white farmers since the colonial era was bought by the government, for redistribution to black farmers. Mr Pohamba, 79, was named recipient of the 2014 Ibrahim Prize for Achievement in African Leadership at a ceremony in Nairobi, Kenya. Mo Ibrahim is a British-Sudanese mobile communications entrepreneur and philanthropist who made billions from investing in Africa. He launched the prize to encourage African leaders to leave power peacefully. The prize was meant to be awarded annually but only three leaders have been deemed worthy of it since it was instituted, in 2007. The inaugural prize was given to Joaquim Chissano, Mozambique's former president, who has since acted as a mediator in several African disputes.